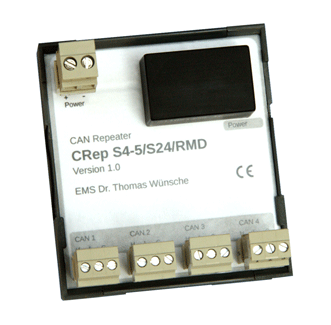 The CRep S4 4-channel CAN Bus repeater transmits and amplifies CAN signals transparent to the CAN protocol. CRep S4 allows the design of flexible wiring topologies, with star and tree structures and stub lines easily realized. When a CRep S4 repeater is used, the effect of the propagation delay through the repeater must be included in the cable length calculation. For a CRep S4 repeater, the typical and maximum propagation delays is 130ns and 200ns, respectively. Assuming a 5.5ns/m propagation delay for cable, the maximum propagation delay through the CRep N repeater is equivalent to a cable length of roughly 36m. The CRep S4 device includes 4 CAN segments, wired by terminal blocks with 3 clamps. The power supply of CRep S4 is separately wired by a terminal block with 2 clamps.